Born June 25, 1900 in Drammen, Norway. Victor started playing soccer at the age of nine. In 1914, at age 14, he served on year in the Norwegian Merchant Marines during World War 1. He immigrated from Norway to the United Sates in 1917 and enlisted in the U.S. Marine Corps as a physical instructor. Shortly thereafter he became involved as a soccer player with Norwegian-American Athletic Club. He founded the Vikings Soccer Club in 1922 and played diligently for 28 years and served as their captain. The Vikings Soccer Club is the oldest existing club in the State of Utah celebrating their 90th anniversary in 2012. 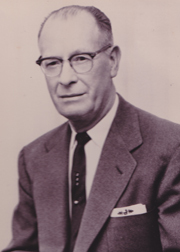 Victor also served as President of the Utah Soccer League during the 1930’s. he was part of the Vikings team that won the coveted Daynes Challenge Cup in 1932-34. His playing career ended in 1955 after he developed knee problems. Victors will be regarded as one of the true Utah Soccer Pioneers.